Why HERS Keeps Getting More Popular | ASTRALCOM - Content Strategy, Conversion Marketing and Customer Acquisition. The celebrated British scientist, William Thomson, valued one’s ability to effectively measure and express anything in numbers. According to him, it demonstrated a deep understanding of the subject. He went on to say, that when you can’t express this in numbers, your knowledge about that topic is meager and unsatisfactory. This is also applicable to a homebuilder when planning to build a new home. One of the most vital of these statistical measurements achieved a significant milestone this past September. 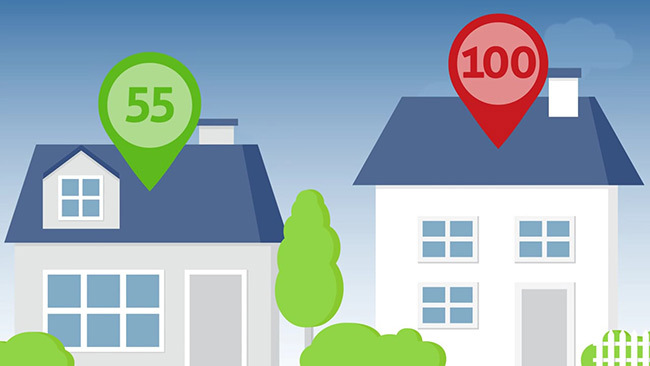 The Residential Energy Services Network (RESNET) is one of the leading networks that monitors home energy efficiency. They recently revealed that they had surpassed scoring 2 million American homes in their Home Energy Rating System (HERS). This index is used to consistently compare a home’s energy consumption with many other homes. In 2016, over 206,000 homes in the US obtained a HERS rating. This helped to minimize carbon dioxide emissions by more than 905,000 tons. Consumers also realized approximately $268 million in savings on their energy bills with the help of the HERS rating. In 2012, RESNET reached the 1 million milestone for homes that received HERS ratings. After this, RESNET collaborated with EnergySmart Builder Meritage Home for its consumer media outreach program. Now that 2 million homes have been certified with HERS scores, RESNET is working with EnergySmart Builder KB Home. Together they will develop a number of media events demonstrating the significance of the HERS index. The primary aim of such an energy benchmark is to furnish homeowners, property managers, and appraisers with a precise and uniform measurement. This figure can be used to compare homes in terms of performance, efficiency, and operational expenses. The secondary objective is to furnish residents with their own ability to manage energy consumption, and in turn, reduce the overall cost. Builder Online has published a very informative article on this topic. Written by John McManus, the benefits of the HERS system to homeowners, financial institutions, and the planet are detailed here. When it comes to the sale of these new homes, the HERS system is an excellent competitive differentiator for builders and real estate agents and even gives these homes an edge over non-certified homes. Check out our informative post about how we leverage HERS certified homes to help show prospective buyers how much money can be saved on energy bills. Leveraging competitive differentiators, like HERS, can help sell more new homes. If you have HERS rated homes (or another competitive differentiator) that you’d like to leverage in order to sell more new homes, then contact ASTRALCOM. We would love to talk with you, reach out today to see how we can take your marketing –and sales – results to a new level.